Obesity, recognized as a disease in the U.S. and at times as a terminal illness due to associated medical complications, is an American epidemic according to the Centers for Disease Control and Prevention (“CDC”), American Heart Association (“AHA”), and other authorities. More than one third of Americans (39.8% of adults and 18.5% of children) are medically obese. 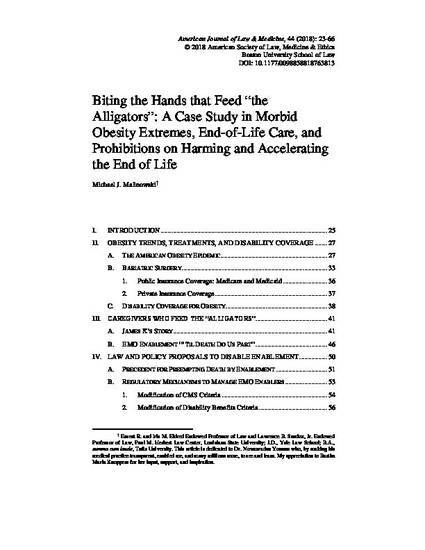 This article focuses on cases of “extreme morbid obesity” (“EMO”)—situations in which death is imminent without aggressive medical interventions, and bariatric surgery is the only treatment option with a realistic possibility of success. Bariatric surgeries themselves are very high risk for EMO patients. Individuals in this state have impeded mobility and are partially, if not entirely, bedridden, highly vulnerable, and dependent upon caregivers who often are enablers feeding their food addictions. The article draws from existing Centers for Medicare and Medicaid Services (“CMS”) and Social Security Administration (“SSA”) policies and procedures for severe obesity treatment and disability benefits. The discussion also encompasses myriad areas in which the law imposes a duty to report on professionals to protect vulnerable individuals from harm from others, and constraints and prohibitions on accelerating the end of life. The article proposes, among other law and policy measures, to introduce an obligation on medical professionals to investigate and report instances of enablement when food addiction has put the lives of individuals at risk of imminent death. The objectives of the proposals are to give providers more leverage to prevent food addiction enablers from impeding treatment and to enable EMO patients to comply with treatment protocols, to save lives and, ironically, to empower enablers to stand firm against the demands of individuals whose lives have been consumed by their food addictions.